Boo! It’s Halloween season again, so this week will feature another spooky film. 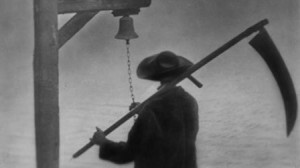 Many film historians consider Carl Theodor Dreyer cinema’s most visionary director, and his talent is on vivid, memorable display in this week’s film recommendation, the pioneering 1932 horror classic Vampyr. The story concerns student of the occult Allan Grey, who arrives at a French town with a blank expression on his face that suggests he might be dreaming. He checks into a small hotel and is startled when a strange man enters his room and gives him a package “to be opened upon my death”. Grey wanders around the hotel, where he encounters a creepy doctor and his elderly female companion, as well as dancing shadows and a one-legged old soldier. Travelling through the town, Grey witnesses the murder of the strange man, leading him to open the package. It contains a book relating the story of the vampyr, one of which is currently menacing the village. 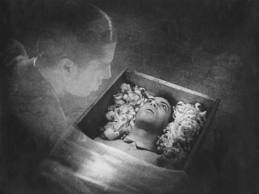 The vampyr’s victims include a lovely young woman who catches Grey’s eye and whom he wants to save. As Grey tries to battle the fiend and its accomplices, he experiences disorienting visions and mysterious events that may daze the viewer as well, but at the same time will compel attention. As the film was destined for release in France, Germany and England, Dreyer kept dialogue to a minimum to avoid language challenges. Instead, he tells the story through unforgettable images: A strange metal sculpture against cloudy skies, an inside-the-coffin view of a live burial, a mysterious figure with a scythe, a relentless downpour of deadly flour, the visible carnal hunger of an incipient vampyr, and shadows that move independently of their casters. The novel visual effects are many, including double-exposure, shooting through cheese cloth and other trickery. No film I have seen quite captures the inner logic of nightmares as well as Vampyr. In our scary dreams, events often seem nonsensical, yet we encounter characters who are completely undisturbed at the maddeningly illogical proceedings. They proceed in their own bizarre course and we proceed along with them because we have no choice but to obey the rules of our nightmare. That is the journey on which this film takes the audience, and it’s completely original and masterfully executed. It’s a tribute to Dreyer’s directorial skills that he got effective performances out of an almost entirely amateur cast, including colorful bon vivant Nicolas Louis Alexandre, Baron de Gunzburg who bankrolled the project and appears under the name Julian West. The other critical ingredient is the groundbreaking camerawork of the legendary Rudolph MatÃ©. The resulting film is probably too “arty” for some tastes, but most viewers will find it stays with them for a long time. p.s. The public domain version of this film is available for free on Internet Archive and is watchable, but you will enjoy yourself much more if you view the Criterion Collection restored version, which is leagues better in terms of visual quality. p.p.s. Interested in a different sort of film? See the full list of RBC recommendations here.